The modern marketer runs a complex “factory” to drive leads throughout the demand funnel—not just drop them in at the top. To get the most out of your demand funnel, and to effectively manage all the processes of demand generation, you need accurate, actionable data on every lead from click to close. Yet the leading CRMs don’t include that kind of reporting, and most marketing teams don’t have the complex technical expertise in-house to develop an effective demand funnel reporting solution. 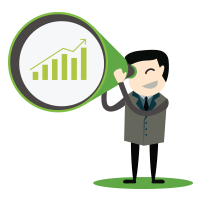 Our innovative Demand Funnel Reporting (DFR) solution is true closed-loop reporting that gives you deep visibility into sales and marketing performance. 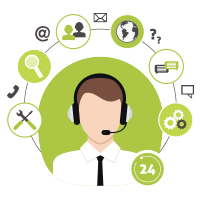 DemandGen DFR integrates with your Salesforce.com implementation to tell you how, when, and why a lead enters the funnel and moves from one stage to the next—as well as its current stage at any given time. 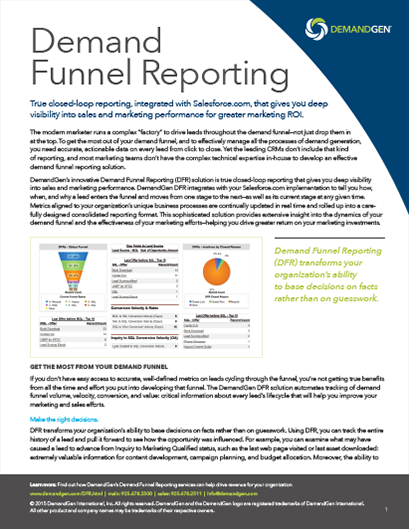 Downloand our DFR datasheet or contact us to learn more about how DemandGen’s Demand Funnel Reporting services can help you drive greater marketing ROI.